This is the presentation of Pavle Sicherl at the joint OECD and Institute for International Design conference, June 18-20, Paris. groups of stakeholders to build their perceptions of the situation. communication tool for policy analysis and debate. example is provided in the Gapminder Community graph. the world, country, regional and local levels. G7 Countries Average is lagging 5 years behind the line to the UN 2015 target. For the net official development assistance 2007 was another disappointing year. The indicator percentage of gross national income devoted to official development assistance (ODA/GNI) was studied in relation to the assumed line to the UN 2015 target of 0.7%. Several of the analysed countries are not officially committed to this target but a common benchmark allows also for the relative comparisons of the assistance effort. 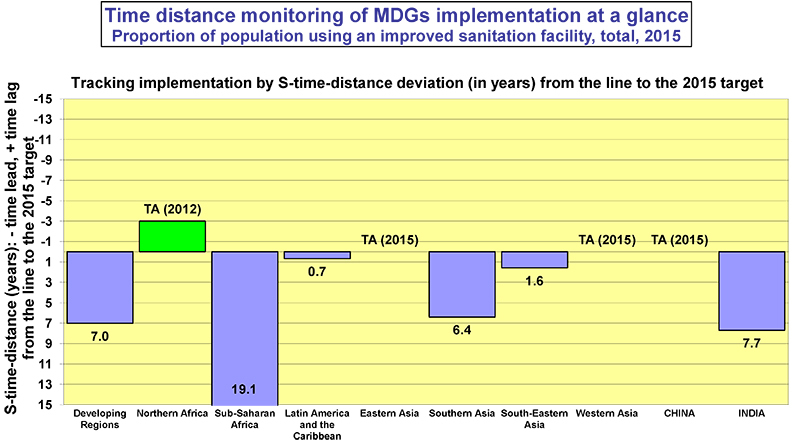 S-time-distance measure was used to get an easily understandable overview of the situation of whether the 22 DAC countries are on- or off- the track to this MDG target. Tracking the timetable for reaching the UN target with time distance showed how widely the performance in 2007 was off the track: the delay of 5 or 4 years for G7 as a group and for DAC total, respectively, is a drastic underachievement. In the seventh year the ODA/GNI value was at the level supposed to be achieved already in 2002 and 2003, respectively, on the line to the UN target. Also the hypothetical projections for 2010 by the OECD-DAC Secretariat indicate that no radical breakthrough is in sight as the time gap would stay unchanged: 5 and 4 years, respectively; the percentage shortfall would amount to 54% for the USA and 59% for Japan. Public awareness of these facts should be instrumental for public pressure on the governments for far-reaching improvements in this domain. There is a wide gap between the development assistance efforts among the observed 22 countries. The ODA/GNI value in the 5 European countries that have already reached the 0.7% target is in relative terms four times higher than in the last group where it is below 0.2%. It is sad that the latter group devoting less than 0.2% of their GNI for official development aid includes 57% of the population of the DAC countries. Furthermore, the whole 88% of population is in the countries with values below 0.4% and between 2-7 years behind the line to target. They need to find the political will to do much better, especially the G7 countries. It is hoped that the forthcoming G8 Summit in Japan can make an important contribution to remedy this unacceptable situation. Annex tables and graphs provide detailed information on individual countries as well as enable the comparisons across them. They are prepared using the free GAPTIMER monitoring tool for calculation and graphing of S-time-distance deviations from the line to target. S-time-distance methodology allows numerous stakeholders to benefit from this novel statistical measure for policy debate for many issues and at various levels. It provides the official organisations as well as the media and NGOs with an additional analytical and presentation tool for continuous monitoring of the implementation of the established targets at world, regional, national, sub-national and business levels. Pavle Sicherl presented S-Time-Distance – A Novel Generic Statistical Measure Providing New Insights from Existing Data at the seminar of the Institute for Health Metrics and Evaluation, University of Washington, Seattle on April 15, 2008.